How Does Ambient Lighting Affect the Design of Landscape and Architectural Lighting? According to Webster’s, the definition of ambient is surrounding; on all sides. For a landscape lighting or architectural lighting designer, ambient lighting typically represents the baseline amount of illumination on a particular property or structure in question – for which the designer may or may not have any control. We’ll talk more about this later in this post. 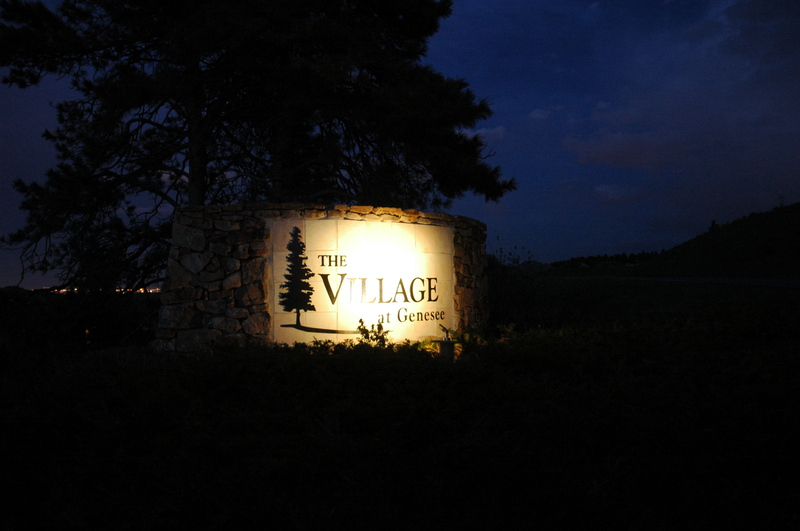 The most important point is that it would be just as irresponsible for a lighting designer to design an outdoor lighting system for a home or business without first knowing the level of existent ambient lighting – as it would be for an architect to design a custom home or commercial building without first having a contour and site plan. For example, in the mountains of Colorado where the only ambient lighting originates from the moon or perhaps the Milky Way, a low voltage quartz halogen (20W) or LED (3.7W) lighting fixture would be more than sufficient to illuminate a community entrance monument. 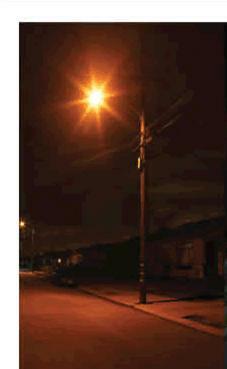 Conversely, trying to illuminate a commercial building or community entrance with low voltage lighting that faces a row of 250W high pressure sodium street lights, just would not be very effective. In this situation, a higher wattage ceramic metal halide or metal halide fixture must be used so that the building or monument is illuminated to at least the level of the ambient lighting, in order to effectively highlight them. The best rule of thumb for any good energy efficient and aesthetic lighting design is to use only the amount of lighting needed – nothing less and nothing more. Lighting designers and lighting contractors love to sell lights, but the operative phrase should be Less Is More. When you are designing a lighting system in the city, ambient lighting may originate from a streetlight across the street or from the overall sky glow that envelopes the entire region. There is nothing that a lighting designer can do about that, except for possibly encouraging the city to adopt more energy efficient and sky-friendly street lighting, etc. However, some glare-producing and inefficient lighting may be self inflicted by the property owners themselves – and lighting designers can certainly make recommendations to improve the overall effect of this lighting so that the new lighting design will not be ruined by the glare-producing ambient lighting. For homeowners, the glare from offending light sources such as carriage lights can be mitigated by replacing the fixtures’ clear glass panels with frosted glass panels, by decreasing the wattage of the bulbs, and/or by dimming the bulbs. The same thing can be done with offending soffit lights by using lower wattage bulbs and/or by dimming them. For commercial building owners, the overall lighting effect can be enhanced by ensuring that all lighting is directed only toward its intended focal plane; e.g., area lighting with full-cutoff (parking lot lighting and walkway lighting) directed downward only (no spillage horizontally); architectural lighting that is directed only toward the building with no glare produced in any other viewing plane. The National Energy Education Development (NEED) project has determined that the percentage of energy consumption in the U.S. dedicated to lighting is roughly 11-percent for homes and 38-percent for schools and businesses. That’s a significant percentage, so by reducing unnecessary glare that contributes to unaesthetic ambient lighting – we can begin to make our nighttime environment more attractive as well as save energy.